In this album, The Heritage Ensemble reimagines popular melodies Hebraic melodies in various jazz, Afro-Caribbean, Brazilian, and classical styles, very much like a mosaic of musical styles. 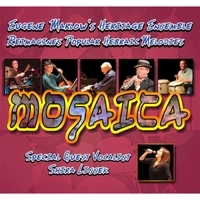 “Mosaica” attempts to convey a picture of the possibilities of cultural collaboration through music. The backgrounds of the Ensemble’s musicians reflect the “Mosaica” of the Ensemble’s repertoire and performance. Bronx-born 7X Grammy-nominee drummer Bobby Sanabria and virtuoso percussionist Matthew Gonzalez are Nuyoricans--they are of Puerto Rican descent, born and raised in New York City. NEA Performance Grantee saxophonist Michael Hashim is of Lebanese descent. Phi Beta Kappa bassist Frank Wagner’s family hails from Eastern Europe. Eugene Marlow's own family background is Russian, Polish, German, and British. This is also the first Heritage Ensemble album that features a vocalist, Shira Lissek, herself a cantor, who brings a prodigious performance to four of the album’s tracks. The “Zikkaron/Kristallnacht (Remembrance) Special Edition” track features aural effects and a narration by Marlow's Aunt Ruth who survived Kristallnacht (“The Night of Broken Glass”) in Leipzig, Germany in 1938.